Should We Pray and Bow Before Images of Mary the Mother of Jesus? 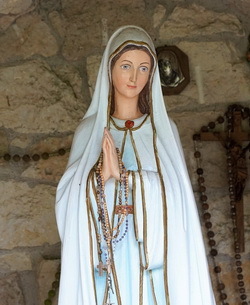 Many religious people pray to Mary, the mother of Jesus, and bow before statues and pictures of her. What does the Bible teach about this practice? People who pray and bow before images of Mary sincerely believe that, if they pray to her, she in turn will make request to Jesus for blessings and forgiveness on their behalf. And since Mary is Jesus’ mother, they believe that He will grant whatever she requests. In the first place, Ecclesiastes 9:6 says that dead people “will never again have part in anything that is done under the sun” (Confraternity Edition). But if Mary could obtain blessings and forgiveness for us, wouldn’t that give her a very significant part in the events of our lives? Yet the scriptures say that neither she nor any other dead person has part in anything done on earth! Next consider 1 Timothy 2:5 which says: “For there is one God, and one Mediator between God and men, himself man, Christ Jesus.” Now one main reason for praying to Mary is so that she will act as our go-between to plead for Jesus to forgive us. Jesus then obtains grace from the Father, He gives that grace to Mary, and she in turn grants it to us, so we are forgiven. In this way, our request goes from us through Mary, through Jesus, to the Father; and grace comes from the Father through Jesus, through Mary, to us (see Glories of Mary, pp 166-171, 127-131). But no matter how you look at it, that makes two mediators between God and man, when the Bible says there should be just one mediator. Finally, according to the Bible, bowing and kneeling before someone as an act of religious honor, constitutes worship. In Acts 10:25,26, a man bowed before Peter, but Peter refused to allow it because he was just a man. In the same way, bowing to Mary is forbidden because she too was only human. The Bible says that only God should be worshiped (Revelation 22:8,9; Romans 1:25; Matthew 4:10). If God wants us to pray to Mary, why is it that no one in the Bible ever prayed to Mary? Why is it that no one in the Bible ever bowed or kneeled giving religious honor to Mary? Please click here to learn more about Bible teaching about Mary.